Escape Goat 2 is a puzzle platformer where you use the environment, your agility, and mighty horns to overcome obstacles and explore a mysterious tower. Venture into the mysterious Stronghold of Toragos. The fate of your friends is at stake! And fear not, for your companion, the friendly Mouse, will accompany you. Magical goat though you are, your powers extend only to an incredible agility. Therefore, you must use the environment to your advantage when faced with the twisted foes and traps of the Stronghold. Operate hidden machinery, evade hazards, and demolish blocks with your mighty headbutt. 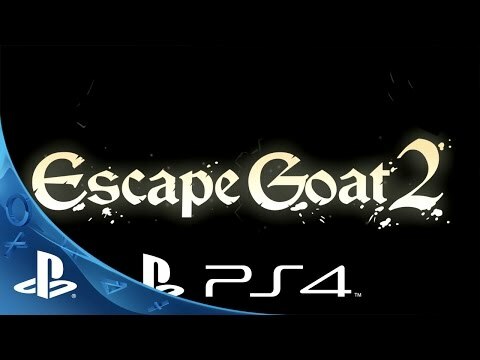 Escape Goat 2 features over 100 rooms to explore, in ten unique zones. Can you discover and overcome them all? Featuring fully hand-drawn, high definition art and animation, and custom physics and lighting effects for a unique and unforgettable experience. Features a unique set of gadgets which interact with one another in special ways. Each one can be either a hazard or a utility, depending on how you use it! For example, a fireball from a foe might be just what you need to ignite an explosive and reach the exit; buzzsaws can be redirected to cleave a path toward a magic item. More than just a cute companion, the Mouse is a vital puzzle solving utility. He can reach places the Goat cannot, by climbing walls and slipping through narrow passages. And should you find one of the magical Mouse Artifacts, his true power will be revealed!